These patch panels are intended for infrastructure installation in venues such as arenas, stadiums, theatres, concert halls, schools, etc. They provide a very robust and reliable XLR patch bay system that is easy and quick to install. Service life is expected to be several decades. Each panel contains 12 pairs of gold-plated Neutrik PC-mount male & female XLR connectors, all mounted on an internal PC board. The PC board connects the vertical columns of male and female connectors together and to Phoenix Spring Cage terminal blocks. The PC boards in panels with the DT-12 connectors also have gold-plated double-row headers that connect to twisted-pair ribbon cables that go to the DT-12 connector assembly. The MP3-445 is a highly versatile, highly configurable MP3 player and automation interface with an onboard audio amplifier, and extensive electrical input and output options. Capable of monitoring 16 separate inputs and driving 16 separate outputs, it can be everything from a deluxe doorbell to the control center for a complex public multimedia display. It operates independently or you can use the built in serial interface to have it control other devices, or be controlled by other devices, including computers. Features include 16 inputs and 16 outputs. The SBA-379 Stereo Balancing Amplifier, which comes in 2 versions, is an economical way to convert two unbalanced audio inputs to balanced outputs. The SBA-379 retains stereo separation with individual L/R gain, while the SBA-379-M model sums the stereo pair to mono and provides two balanced outputs with individual gain controls. Built for the cable TV industry, the mono version eliminates the distortion, unpredictable frequency response and potential equipment damage that can result when a Y-cable is used to sum two outputs. Conventional dual input connectors provide both RCA and screw terminals. The SBA-379 is built into a rugged diecast aluminium box. Power is provided via a 24 VDC CSA/UL approved adapter. 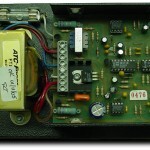 The card consists of two transformers with RCA jacks on one side and PC terminals on the other. 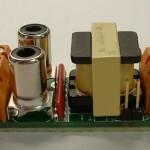 The transformers provide passive balancing for audio level signals. Use it for either input or output balancing. The card is very easy to hook up and the frequency response is exceptional – it’s almost a flat line from 30 Hz to well over 20 kHz. The printed circuit board mounts in a plastic track using a strip of foam tape. The card can also be purchased without the track for mounting with 6-32 spacers. 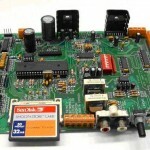 The MOH-379 Music-On-Hold Interface provides gain and isolation for connecting an external audio source to the music on hold input of a telephone system. It converts an unbalanced stereo pair to both a mono balanced output and a mono unbalanced output each with separately adjustable gain. The balanced output is transformer isolated, and it’s bandwidth is limited for better compatibility with telephone systems. Conventional dual input connectors provide both RCA and screw terminals. The MOH-379 is built into a rugged dicast aluminium box. Power is supplied via 24 VDC CSA/UL approved adapter. T he L328 Single Balanced Input Board is a very high performance yet economical way to add balanced inputs to audio gear that has only unbalanced inputs. The board is relatively small at 1.75″ x 0.625″ and can be mounted anywhere using double sided foam tape, or it is also designed so it can be soldered directly to the back of any standard XLR type connector as shown in the picture below. T he L314 Dual Balanced Input Board is a very high performance yet economical way to add pairs of balanced inputs to audio gear that only has unbalanced inputs. The board is relatively small at 2.75″ x 1.2″, and is ideal for mounting in equipment racks such as those used in broadcast, recording or editing facilities. U pgrade your RTS Systems 802 Intercom Master Station from 6 to 12 channels. 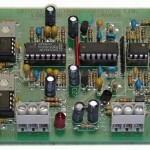 The L347 is a drop-in replacement for the AS3000 board that changes the 802 or 802A from option B1 to B3. 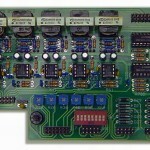 This card adds channels 7 through 12 to your 802 or 802A. The AS3000-3 is no longer available from RTS but the L347 is an exact replacement… brand new and warrantied! Custom amplifier modules for a rack based, large area public address system. This unit includes a noise gate and automatic gain control. O riginally designed to combine front and back seat microphones used in mobile video recording applications, this card can be used anywhere to amplify 2 mic level inputs to line level. With built in AGC and individual gain adjustment.